DOWNLOAD Over 215 Classic Snap Samples w/ Free Upload! Raw Snapz samples all modeled after Timbaland, T. Pain, Lil Jon, Alex da Kid, Stargate, Storch, & Mr. Porter! Hundreds of expressive snaps samples are included: Dry Snaps, Quick Snaps, Intimate Snaps, Wild Snaps, Loose Layered Snaps, and Tight Layered Snaps! Containing 7 sampler formats & 9 software sampler presets, all 218 snaps samples auto-load instantly into your sampler of choice! 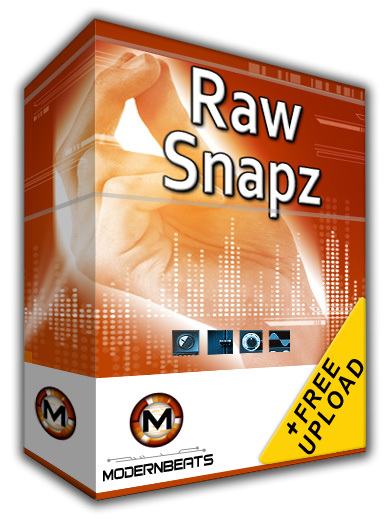 In addition to the 9 auto-loading software sampler presets included, 'Raw Snapz 1' also features a large SF2 soundfont bank for soundfont users. The soundfont bank includes 9 internal SF2 presets for easy scrolling and auditioning of snaps within the user's soundfont-supporting sampler. In total, the snaps set features 9 software sampler presets, plus 9 SF2 soundfont presets that automatically load all 218 snaps samples into your software sampler of choice: Reason NN-XT (.SXT), EXS24 (.EXS), Kontakt (.NKI), Battery (.KIT), Halion (.FXP), Soundfont (.SF2), and WAV (.WAV). Compatible with FL Studio, Fruity Loops, Acid Pro, Logic Pro, Cubase, Reason, & Pro Tools.